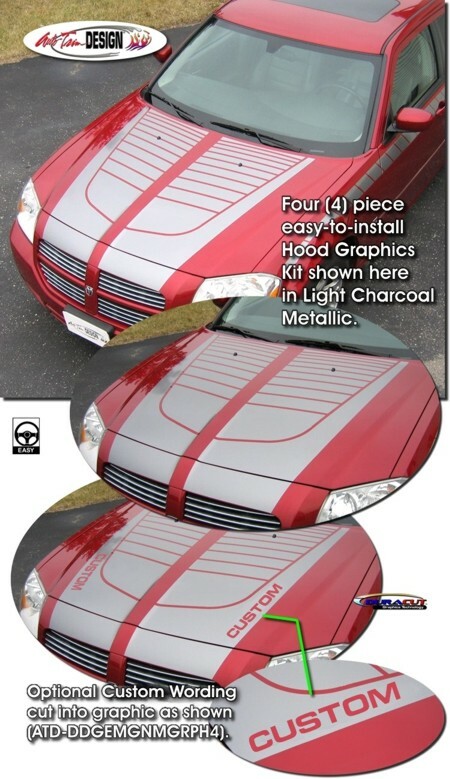 Make your '05-'07 Dodge Magnum "Tough-looking" with this unique Hood Graphics kit. This easy-to-install kit is packaged as a set of four (4) PRECUT pieces, ready to install in a wide variety of colors - NO TRIMMING required! As you can see, this stripe package is not just a set of 20" strips in a box. Our graphic kit consists of prefitted and contoured pieces as shown in the illustration. This kit is specifically made for the '05-'07 Dodge Magnum factory hood as shown and will not fit any other vehicle. Choose from a solid front side area or customize it with unique wording as shown. Simply enter the Custom Wording of your choice (up to seven  letters/digits/spaces) and we'll make it happen. Either way it'll look Terrific! Each graphic panel has an overall dimension of 49.677"x 21.829" (126.18cm x 55.45cm). Graphic spacing at front of grille is 2.625" (66.675mm) and 3.75" (95.25mm) at the rear of the hood. We suggest temporarily removing the windshield washer nozzles for ease of installation. Graphic kit WILL NOT fit the '08 Dodge Magnum due to indentations found in the newly designed factory hood.